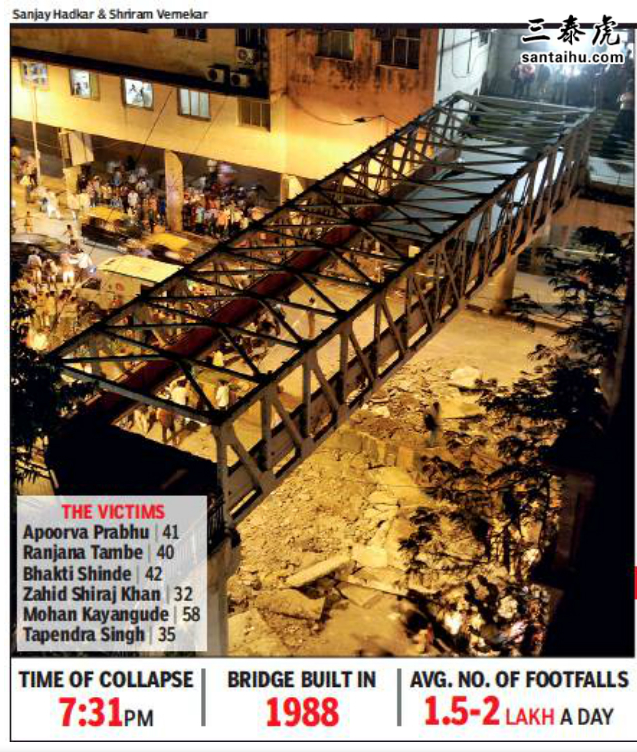 MUMBAI: In yet another bridge collapse near the city’s suburban railway stations, the nodal foot over-bridge at the northern end of Chhatrapati Shivaji Maharaj Terminus (CSMT) came crashing down on Thursday evening. Six commuters were killed and at least 34 injured. The number of casualties is expected to rise. At 7.31pm, there was a loud thud. The flooring of the ‘Himalaya bridge’ on the arterial D N Road had given way, taking down scores of rush-hour commuters from a height of 35 feet. CM Devendra Fadnavis announced an ex-gratia of Rs 5 lakh to the families of the dead and Rs 50,000 for the injured.“I have ordered a high-level inquiry. Such an incident raises questions about the audit,” he said. The city police has lodged an FIR against some BMC and CR officials for negligence leading to death. They may also add a charge of culpable homicide not amounting to murder after ascertaining details about the role of the BMC and railways. Shortly after the CST footover bridge disaster, joint commissioner of police (law and order) Deven Bharati said police had registered a case of causing death by negligence under Section 304 (A) of the Indian Penal Code against concerned officials of the BMC and railways. “More stringent sections will be applied if additional facts emerge during the course of the investigation,” he said. Another senior officer said they may add the section of culpable homicide not amounting to murder. A senior officer said welding points at the girders appeared to have rusted and will be examined as a cause of the collapse. 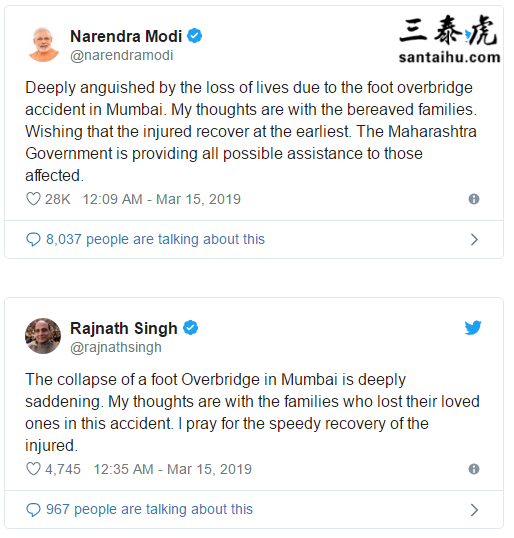 PM Narendra Modi and Union home minister Rajnath Singh tweeted their condolences. Few know the bridge leading out from CSMT station by its official name of Himalaya Bridge. For years, commuters had noticed the structure shake beneath their feet, especially during peak-hour pedestrian movement, or when trains passed beneath the portion leading to the platforms. The authorities had relaid the tiles in 2016, but this problem persisted. On Thursday, their worst fears were realised as the structure collapsed, causing pedestrians to plunge from a height of 35ft. Quality of life is worst in Mumbai. This shows the quality of the engineers along with the engineering colleges! Also, what if the engineers who audited the bridge are from the reserved category? Ambani''s Slave FEKU has promised his master a Bullet Train. Let Public die, FEKU does not care. dont forget to vote for the BJP guys ! When we see surgical strike on the corrupt politicians ?? Only 25% of the budget is used rest goes to corrupt politicians and government officials. We always listen KASHMIR PAKISTAN KASHMIR Surgical Strike etc and next we see one more terrorists strike. Is this the fate of our Country ?? Corruption are the biggest evil that India is facing today. We need systems in place to get rid of human interference and increase public awareness about them to inprove quality of life. BJP and Shiv Sena both are running corporation and responsible for this. Now some smartee would say “ the bridge was made during congress rule” not our fault. Police can file FIRs against corrupt and incompetent audit authorities and BMC officials, but it is the Indian courts who have to start doing their job. Unless these thugs are punished immediately, such negligence will continue to take a toll of innocent commuters. Are the auditors qualified enough to make an appropriate assessment. QUALITY OF LIFE SEEMS WORST IN MUMBAI NOW-A-DAYS. 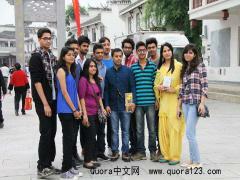 Out of 1.3 billion people of India, if only six are killed, it will not make any dent in the vote bank of Modi. Thank god no one blamed nehru . Now bjp shiv sena blame game will start even when both are fighting election together. Civic authority engineers only know how to collect their cut from contractors for all the work. 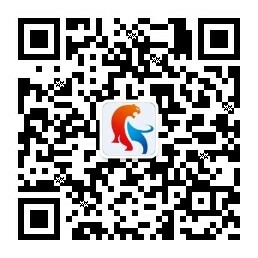 They are no longer engineer who can do any technical analysis on safety of civil structures. The result is obvious. The murder changes should be laid down against the Chief Engineer of the region. Take these politicians and officials on to these bridges during peak hours and throw them on the tracks in full public view.But you may never know.They may not die as they are more resilient than any Cockroach . Mumbai is no more a safe place for human beings. As usual, corrupt and inefficient municipal corporation officers negligence caused an accident. System of municipal corporations should be abolished and a department of civic services should be made directly under the ruling govt.